Definition: Oxidative stress reflects an imbalance between free radicals and antioxidants in our body. It occurs when excess oxygen radicals are produced in cells, which could overwhelm the normal antioxidant capacity. Free radicals are oxygen-containing molecules with an uneven number of electrons. The uneven number allows them to easily react with other molecules. Free radicals can cause large chain chemical reactions in our body because they react so easily with other molecules. These reactions are called oxidation. They can be beneficial or harmful. When the concentration of reactive species is not controlled by internal defense mechanisms such as antioxidants (tocopherols, ascorbic acid, and glutathione) or enzymes involved in oxygen radical scavenging (catalase, peroxidase, and superoxide dismutase, SOD), oxidative damage occurs to proteins, lipids, and DNA, which could lead to cytotoxicity, genotoxicity, and even carcinogenesis when damaged (mutated) cells can proliferate. Oxidative stress from oxidative metabolism causes base damage, as well as strand breaks in DNA. Base damage is mostly indirect and caused by reactive oxygen species (ROS) generated, e.g. O2− (superoxide radical), OH (hydroxyl radical) and H2O2 (hydrogen peroxide). Further, some reactive oxidative species act as cellular messengers in redox signaling. Thus, oxidative stress can cause disruptions in normal mechanisms of cellular signaling. Everyone produces some free radicals naturally in their body through processes like exercise or inflammation. This is normal and part of the body’s intricate system of keeping itself healthy. A diet high in sugar, fat, and alcohol may also contribute to free radical production. Effects of oxidative stress: Oxidative stress leads to many pathophysiological conditions in the body. Proteins, lipids, and DNA make up a large part of our body so that damage can lead to a vast number of diseases over time. Some of these include neurodegenerative diseases such as Parkinson’s disease and Alzheimer’s disease, gene mutations and cancers, chronic fatigue syndrome, fragile X syndrome, heart and blood vessel disorders, atherosclerosis, heart failure, heart attack, and inflammatory diseases. Biological effects of single-base damage by radiation or oxidation, such as 8-oxoguanine and thymine glycol, have been extensively studied. Recently the focus has shifted to some of the more complex lesions. Tandem DNA lesions are formed at the substantial frequency by ionizing radiation and metal-catalyzed H2O2 reactions. Under anoxic conditions, the predominant double-base lesion is a species in which C8 of guanine is linked to the 5-methyl group of an adjacent 3′-thymine. Most of these oxygen-derived species are produced by normal aerobic metabolism. 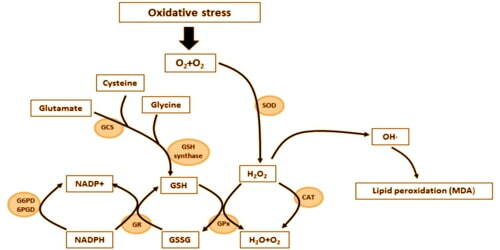 Chemical effects of Oxidative stress: Chemically, oxidative stress is associated with increased production of oxidizing species or a significant decrease in the effectiveness of antioxidant defenses, such as glutathione. The effects of oxidative stress depend upon the size of these changes, with a cell being able to overcome small perturbations and regain its original state. However, more severe oxidative stress can cause cell death, and even moderate oxidation can trigger apoptosis, while more intense stresses may cause necrosis. 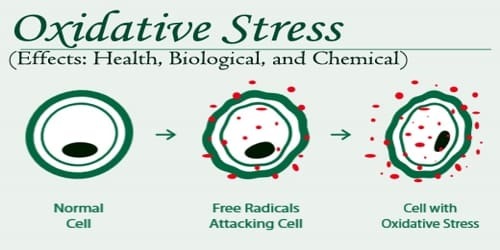 Oxidative stress could result from the following: (1) the presence of xenobiotics, (2) the activation of the immune system in response to invading microorganisms (inflammation), and (3) radiation, which makes oxidative stress a common denominator of toxicity or stress.